One nurse is responsible for nine patients – even during the early shift! Everyone is aware of the care crisis in Germany. Germany considerably lags behind other countries with regards to its staffing in the care sector. While in the US on average one nurse is responsible for five patients in a hospital in Germany with nine patients the amount is almost the double only during the early shift in ambulatory nursing services and hospitals! According to Ver.di-analyses hospitals lack more than 70,000 nurses - with increasing tendency. However, the German care sector does not only differ from other countries. Within the country itself there exist some considerable regional discrepancies in staffing as well. MEDWING set itself the mission for 2018 to analyze the working conditions in the German care sector in order to better understand the current nursing crisis. More than 2,700 staffs from the care sector participated in the survey - from nurses, caregivers up to care managers, charge nurses or residential care managers. In our first part of our survey we took a closer look at the respective nursing keys and discovered some interesting findings. Especially, during the early shift - the shift where most of the administrative tasks are performed - the average nursing key is still very high. On top of that, the patient ratio does not only vary between the different facility types or departments but also between the different regions in Germany. Comparing the area of elderly care and the area of nursing some interesting differences came to light. In the area of elderly care the patient ratio was generally higher than in nursing. 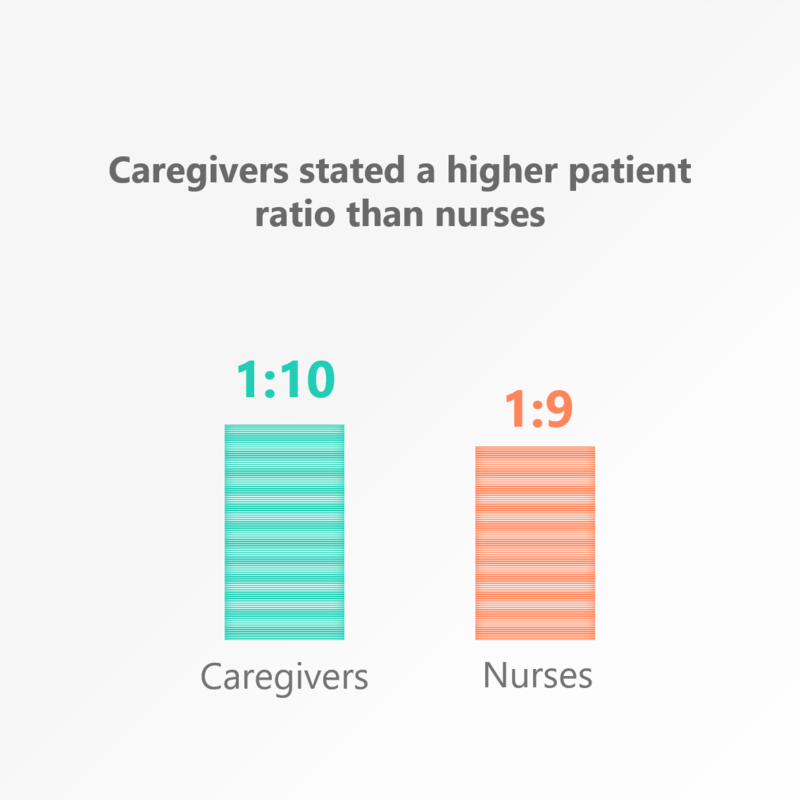 In elderly care caregivers usually stated an average nursing key of around 1:10 meanwhile in hospitals nurses stated an average key of around 1:9. This result was further supported by the different nursing keys that were stated for the various departments. 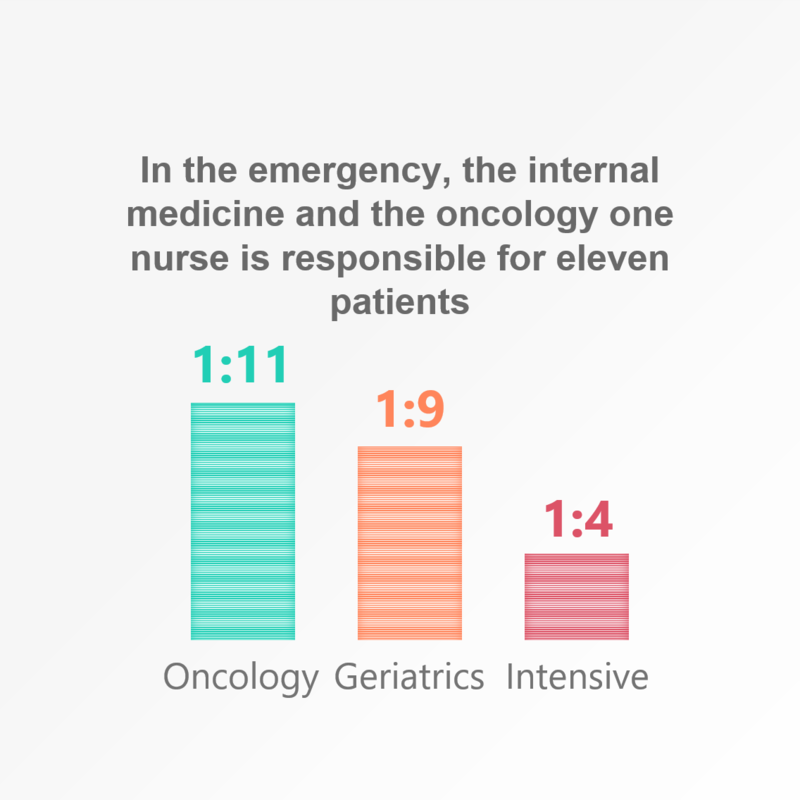 Although the emergency department, the internal medicine and the oncology department exhibited the highest patient ratio with a nursing key of 1:11, they were closely followed by geriatrics and the ambulatory care service. 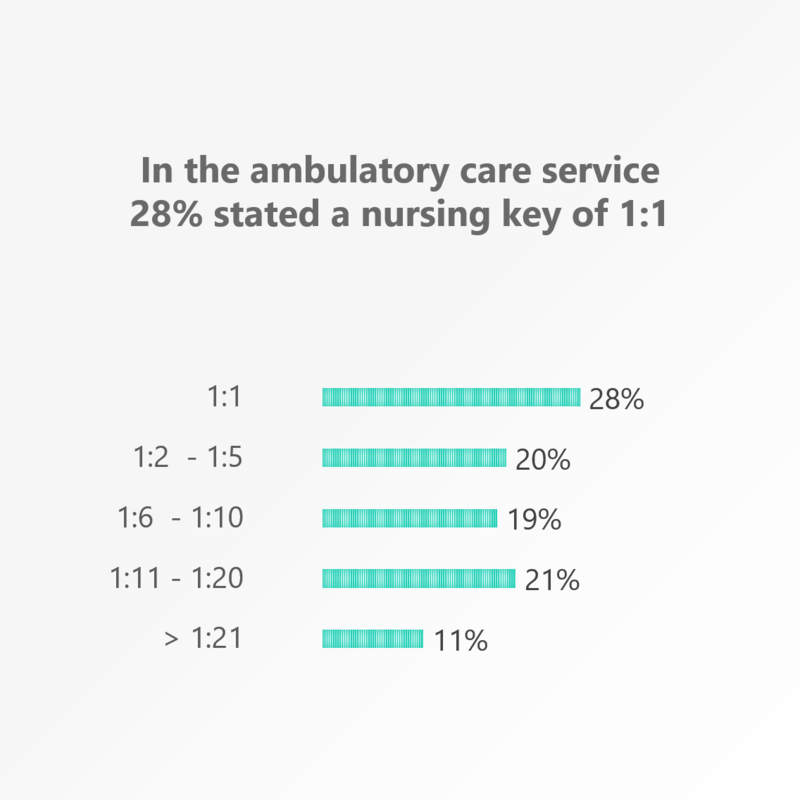 Now some people might be surprised by the fact that the nursing key in the ambulatory care services was lower than 1:11, given the fact that the nursing key in these facilities usually are around 1:30 or even higher. What should be taken into consideration here is the fact that this survey did not capture the several specializations of the ambulatory care services. For example, around 28 % of all respondents working in ambulatory care services stated a nursing key of 1:1 which leads to the assumption that a major part of those respondents was working in the area of out-of-hospital respiration and ambulatory intensive care. Not only in ambulatory care services the area of intensive care demonstrated the lowest patient ratio but also in the hospital the intensive care department exhibited with a nursing key of 1:4 one of the lowest ratios, closely followed by the medical function diagnostic department. However, the differences were not only discovered among facilities and departments but also in the different regions of Germany. Especially in the eastern part of Germany the nursing key was considerably higher than in the west. In particular Brandenburg, Saxony-Anhalt and Saxony exhibited the highest nursing keys with an average number of 1:10. On top of that, the different nursing keys could also have a direct impact on the perceived superior's appreciation. Especially in Saxony the staff felt less appreciated than in other regions of Germany. Besides the lower appreciation levels nursing staff from the east also perceived the employment of leasing staff in emergency situations as significantly higher than in the west. Is the understaffing in the east of Germany even more prominent than in the western part? The differences between north and south were relatively similar. In this case, the southern part exhibited a lower patient ratio than the north. The main reason for this result could be the states Hessen and Baden-Wuerttemberg. Here, the staffs in the care sector stated an average of seven to eight patients per nurse. After this analysis it can be concluded that understaffing in the care sector still remains a current problem in Germany. The government's plan of introducing minimum levels of staffing in certain care departments in 2019 could be one step into the right direction. To which professional group do you fit the best?